Happy Monday all!! Is anyone else thinking it's crazy that tomorrow is already October? I remember back in elementary school that when the first week of October hit, we started our countdown to the holidays. We'd make the chains of construction paper for Christmas. My favorite time of year and I'm oh so ready! In the meantime, we had a very nice weekend. On Saturday my parents and I took a drive up to Maine, about two hours away. I have twin cousins, boy and girl, and they both are very involved in activities The girl is apart of marching band for her high school. They do shows, go on trips, you name it and they do it. It's so nice to see her enjoy something this much! There was a performance Saturday night. 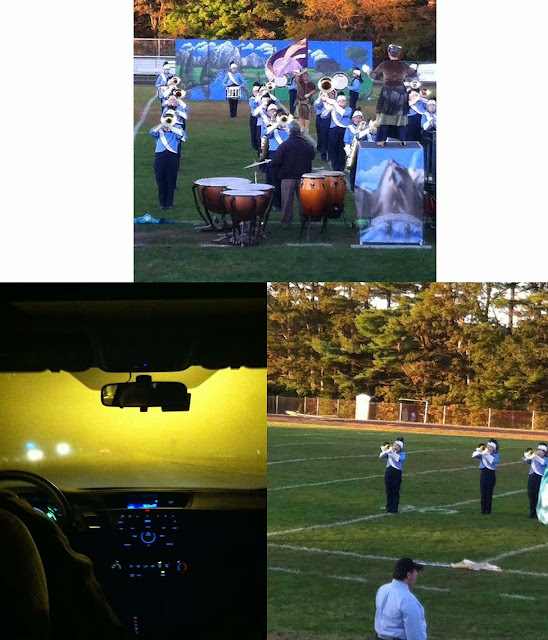 8 bands from 8 high schools, including hers. They were getting judged and would get recognition at the end of the night. I'm not really into watching school bands or anything but I have to say it was really neat and I really enjoyed it! Downsides were: sitting on the bleachers for over two hours, it was freezing and we had to get food from the concession stands. Cold hot dogs and not cooked burgers. That part wasnt exactly fun. We got to Maine about noon. Had lunch at my aunts and then drove down to the area where the performance was. It was right near the beach so my parents, aunt and I took an hour or so and walked around. The board walk was closed except for a store or two but it was still fun to walk around. They also have amusement rides that line the beach. We left around 8:30, and stopped for some burger king (can you say crappy food overload? I'm eating fruits for a week!). 1) Beautiful night for a concert! 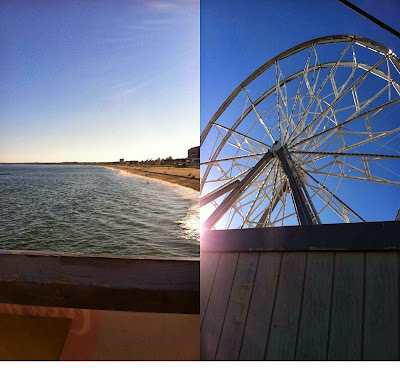 2) Never realized they take the seats off the Ferris wheel during fall/winter. 1) Such a great beach and area! 2 and 3) Haven't been to the board walk in years. Course, it'd be so cool to go to one of the places that has the big board walks with food and rides. Where do they have those? 4) I'm sad it looks like this. It was taken from my iphone so it's actually a height-wise picture but I distorted it for this reason. 1) The best fish chowda! 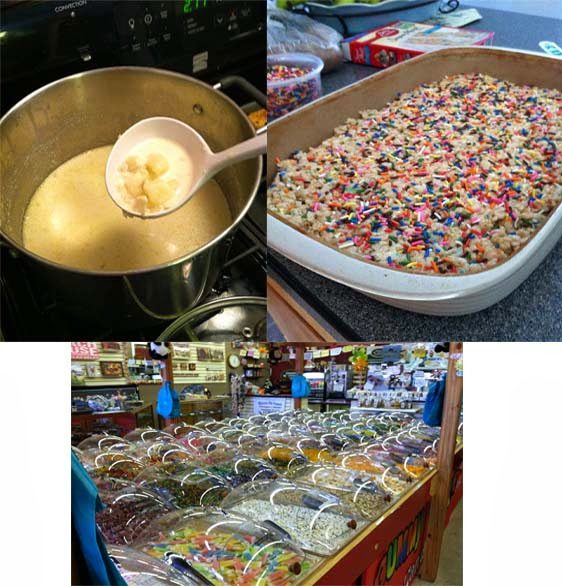 2) Cake batter rise krispie treats with sprinkles mixed in and on top. Sweet but so tasty. I might even share the recipe! 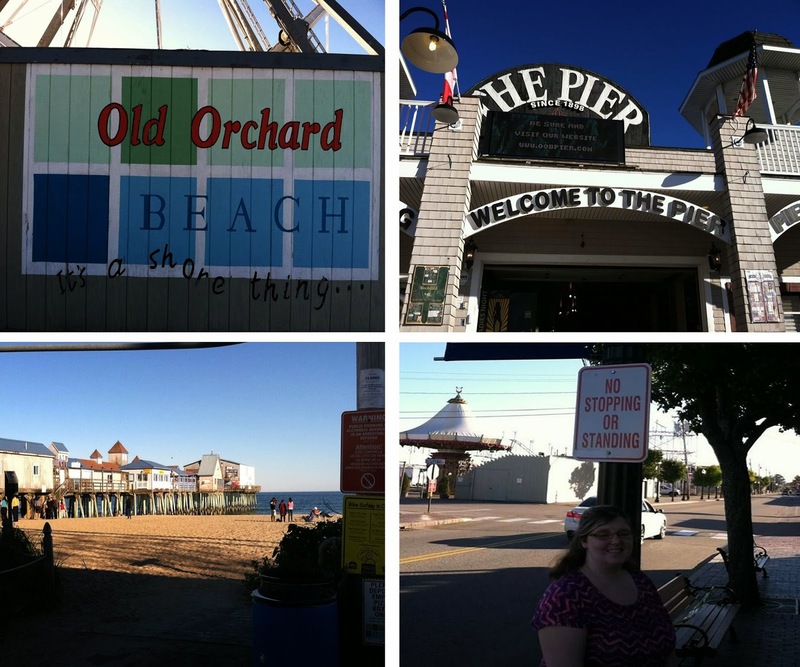 3) Cant pass up the candy store on the board walk! 3) On our way home. You couldnt see anything for a good few minutes. Have any of you taken band or anything similar?! Sounds like a super fun weekend, girl!! !